Among the most celebrated figures in Tibetan history are the “dharma kings” (chögyal in Tibetan) who supported Buddhism and helped it to take root in Tibet. And probably the most important of all the dharma kings is Tri Song Detsen. Prince Song Detsen was given the title Tri – meaning “throne” – when he came of age, and he wasted little time in curbing the anti-Buddhist movement that had taken root in recent years since the death of his father, the previous king. Seeking Buddhist teachers, first from China, then from Nepal and India, he went about getting Tibet its first proper monastery. That monastery, Samyé, was built with the help of the Nepalese abbot Śāntarakṣīta and the tantric adept from modern Pakistan, Padmasambhava. The king also supervised the ordination of the first Tibetan monks, and a vast project for the translation of Buddhist scriptures into Tibetan. IOL Tib J 466 is a scroll with a long prayer of offerings to the buddhas, bodhisattvas, deities, dharma kings and patrons of Buddhism. First among the kings is, of course, Tri Song Detsen. I respectfully make the offering of homage. I suspect that this prayer dates from not too long after the reign of Tri Song Detsen himself. Every aspect of the scroll – paper, ink, handwriting, and the arrangement of the text on the page – is similar to the sutras commissioned by the last Tibetan kings at the end of the Tibetan Empire in the 840s. So the scroll may have been written only a half-century after the end of Tri Song Detsen’s reign. The prayer puts Tri Song Detsen right into the historical tradition of dharma kings. Dharmāśoka is of course the famous Aśoka, ruler of the great Mauryan Empire in the 3rd century BC, and patron of Buddhism. Some of the edicts that he had carved throughout his empire still survive, and confirm that he was, to some extent, a Buddhist king. He is said to have convened the third council of the Buddhist sangha to clear up some doctrinal issues. As for Kaniṣka, he was the ruler of the Kushan Empire, based in Gandhara in the 2nd century AD, and we have evidence from the coins made in his reign that he supported Buddhism (among other religions). He is also credited with organizing a Buddhist council for the compilation of a Sanskrit Buddhist canon. Considering the importance of the councils that Aśoka and Kaniṣka are supposed to have convened, it’s not surprising that the debate between Indian and Chinese Buddhism organized by Tri Song Detsen is often considered to be another council – in the grand tradition of dharma kings. As well as associating Tri Song Detsen with this Indian tradition of dharma kings, the prayer highlights the divine and magical nature of Tibetan kingship. The king has “mastered the royal methods of fortune.” What I’ve translated here as “fortune” is the enigmatic word phywa. In later Tibet it refers to luck, fortune-telling and the like. During the time of Tibet’s imperial kings, it seems to have been the special possession of the kings, but it as a method rather than a personal quality. In any case, there wasn’t much distinction between the kings and the gods. The prayer also says that Tri Song Detsen “rules the kingdom with the sword of the sky-gods.” What does this mean? The Tibetan kings were thought to be the descendents (literally!) of a race of gods who lived in the sky, and came down to earth to perform their kingly duty. Instead of dying, they ascended back to the sky – beamed up along a “sky-cord” made of light. Later generations, including Tri Song Detsen, were said to have lost the sky-cord connection. Nevertheless, they were still the children of the gods (lhasé). That sword is an interesting symbol of the king’s military power, something that is downplayed – if not totally ignored – by many later Buddhist historians. Did Tri Song Detsen really carry a sword said to be inherited from his divine ancestors? 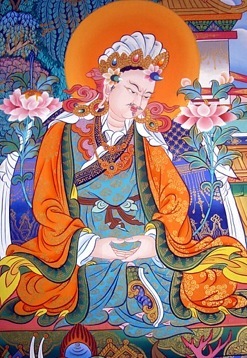 So it seems to me that in this prayer Tri Song Detsen stands somewhere between the earlier vision of Tibetan kings as agents of the divine – with magical military power and special royal methods of prognostication – and ideal of the Buddhist king as a patron and practitioner of Buddhism above all else. 1. Karmay, Samten. 1998. “King Dza / Tsa and Vajrayāna” in The Arrow and the Spindle: Studies in History, Myths, Rituals and Beliefs in Tibet. Kathmandu: Mandala Book Point. 2. Richardson, Hugh Edward. 1998. “The Dharma that fell from Heaven” in High Peaks, Pure Earth: Collected Writings on Tibetan History and Culture, Edited with an Introduction by Michael Aris. London: Serindia. 1. Tri Song Detsen: detail of 20th c. painting, sourced from Wikipedia. 2. Coin of Kanishka, (c) The British Museum. 3. Sky-cord (OK, a tornado). As I mentioned in the last post, modern scholars have questioned the traditional Tibetan story that the Tibetan emperor Lang Darma persecuted Buddhism and was consequently assassinated by a monk. The moderate critique suggests that the persecution was really just a withdrawal of patronage from the monasteries and a curtailment of the monks’ involvement in political affairs. The extreme critique (put forward by the Japanese scholar Yamaguchi) is that this whole story is a “fiction”: Lang Darma was a good Buddhist king, and was assassinated not by a monk, but by the anti-Buddhist faction at the Tibetan court. The monks knew what needed to be done, and there was no conflict. All the people of Tibet were joyful and happy. A vajra assistant can be bought with a donkey. A guiding master can be bought with an ox. A vajra regent can be bought with a horse. A vajra king can be bought with an antelope. Know nothing of the transworldly meaning. And nobody listens to the divine dharma. And the number of vajra assistants is uncountable. Won’t the vajra body be destroyed? If the author of this poem is to be believed, the problem is not that Buddhism is dying out in Tibet, but that it is flourishing so much that it is impossible to control it. The problem is a lack of authority: with nobody to judge who is a genuine tantric master and who is not, masters outnumber students, and people wrongly believe themselves to have fully accomplished the deity yoga. (These complaints are, of course, familiar tropes in later Tibetan literature, but I won’t follow that tangent here). Now, no persecution is mentioned here, it is true, but the names of Darma and his son/nephew Ösung are not held in high regard at all, and they are contrasted with Trisong Detsen, the great Buddhist king. This attitude seems to be reflected elsewere in the Dunhuang manuscripts, in a list of kings who practised the Mahayana, which conspicuously omits Darma and Ösung (Pelliot tibétain 849). Again, I can offer no definitive answer to the question that heads this post, but let us at least be clear that this poem in Pelliot tibétain 840 is not a celebration of the state of Buddhism during and after Lang Darma’s reign. On the contrary, it shows that Buddhism was seen as going into a decline in this period. Strangely enough, considering the later stories of persecution, the decline is caused by Buddhism flourishing “too much” so that everybody wants to be a tantric master. What this suggests, at least in the view of the author of our poem, is not that Lang Darma persecuted Buddhism, but that in some way he failed to manage the spread of Buddhism properly. Perhaps, in truth, Lang Darma was not an enemy of Buddhism, but, in his fondness for wine and hunting, neglected to take care of it. 1. Karmay, Samten. 1981. “King Tsa/Dza and Vajrayāna”, in Tantric and Taoist Studies in Honour of R.A. Stein, vol.1, edited by M. Strickmann. Brussells: Institute belge des Hautes études chinoises. 192-294. 2. Stein, R.A. 1986 “Tibetica Antiqua IV : La tradition relative au début du bouddhisme au Tibet.” Bulletin de l’Ecole Francaise d’Extreme Orient LXXV: 169-196. 3. Yamaguchi, Zuihō. 1996. “The Fiction of King Dar-ma’s Persecution of Buddhism”. In Du Dunhuang au Japon: Études chinoises et bouddhiques offertes à Michel Soymié,edited by Jean-Pierre Drège: 231–58. Geneva: Droz. Rolf Stein translated this as “Depuis le «fils de dieu» (lha-sras) Dar-ma, depuis le «petit-fils» (dbon-sras) ‘Od-srus (lire srung)…” essentially the same as my translation. But he believed we needed to amend man chad to yan chad to get this meaning. Karmay on the other hand, amends only the last man chad to yan chad, and translates “From the time of the Divine Son, Darma / Down to the time of ‘Od-srung and his descendents.” Yamaguchi believes no amendations are needed, and translates, “Until the divine son Darma and until ‘Od-srung and his descendents…” This only makes sense if we accept his interpretation that the text is giving a positive assessment of Buddhism during the reigns of Darma and Ösung, which is hard to accept when we look at the poem as a whole. In fact I think Stein had it right, but didn’t need to amend man chad to get the meaning he wanted. We have several other instances of man chad in the Dunhuang documents, and in the cases I’ve looked at, it means “down from” or “from X down”. Examples from the OTDO website include the lists of ranks in Pelliot tibétain 1071, 1072 and 1075, the amounts of money in IOL Tib J 733. Anyway, I will put a transcription of the whole text in a comment to this post; further suggestions are welcome (as ever). 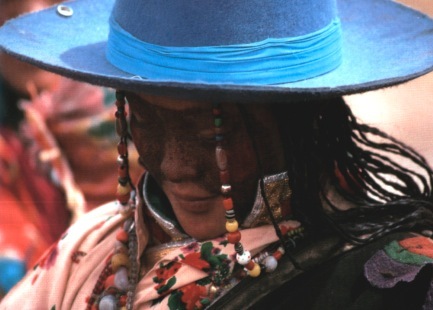 Lhalung Palgye Dorje set out for Lhasa, wearing a black hat and a black cloak with a white lining. He smeared charcoal on his white horse and concealed his bow and arrow in the long, flowing sleeves of his cloak. When he reached Lhasa he left his horse tied near a chorten (stupa) on the banks of the river and walked into the city. He found King Lang Darma ang his courtiers reading the inscription of the treaty-pillar located in front of the Jokhang Temple. Prostrating himself before the King, the monk freed his bow and arrow without being detected and then, standing up, he fired an arrow straight at the King’s heart. While the King was in his death throes and the people around him thrown into confusion, Lhalung escaped to the river bank. Mounting his horse, he forced it to swim across the river to wash the charcoal away and then, reversing his cloak so only the white lining showed, he returned to Yerpa by a devious route. A number of folk tales have since sprung up about Lang Darma. He was supposed to have had horns on his head and a black tongue. To hide his horns, he arranged his hair in two plaits, tied in a raised knot on either side. No one supposedly knew this at the time, unless it was his hairdresser. It is said that this is the origin of the practice for the Tibetan lay officials to plait their hair in this manner. It is also said that some Tibetans, when they scratch their heads and put out their tongues on meeting high-ranking persons, do so to show that they have neither horns nor black tongues. These stories and customs are fun, and the traditional dances based on them are impressive (see the picture below). But some modern scholars have wondered whether Lang Darma really persecuted Buddhism at all. Some have suggested that rather than persecuting Buddhism, Lang Darma simply reduced government support to the monasteries as his empire became financially overstretched. At least one has argued that the whole story of the assassination is a later fabrication. The most thoroughgoing attempt to overturn the traditional story has been made by the Japanese Tibetologist Zuihō Yamaguchi. His rather brilliant article has a complicated argument, relying much on the Chinese historical sources which do not mention any assassination. For now let’s just look at one interesting aspect of Yamaguchi’s argument: his contention that Lang Darma was in fact a fervent Buddhist. Yamaguchi uses a Dunhuang manuscript, Pelliot tibétain 134, as evidence that Lang Darma was really a Buddhist. The manuscript contains an aspirational prayer (mönlam) for the king upon his accession to the throne of the Tibetan Empire. According to Yamaguchi, the prayer states that Lang Darma has already made many offerings to the sangha, is particularly devoted to the Prajñāpāramitā sutra. May the fact that we worship and chant the sūtra that you yourself recited, the Prajñāpāramitā, lead to all living beings obtaining the teachings of the Mahāyāna and obtaining the seeds of enlightenment. May the offering and hearing of the sutras, the personal teachings [of the Buddha] such as the Prajñāpāramitā, lead to all existing living beings obtaining the teachings of the Mahāyāna and obtaining the seeds of enlightenment. Readers of Tibetan can make their own judgement (see the Tibetan text at the end of this post) but as far as I can see there’s nothing here about the king having recited the sutra himself. The part that Yamaguchi translated as “that you yourself recited” (zhal nas gsungs) actually refers to the fact that the sutras are the teachings of the Buddha, as we see in other Dunhuang Buddhist texts (like IOL Tib J 66). So, this prayer looks to me like a reference to the traditional practice of Tibetan kings acting as patrons for the writing and recitation of sutras. It is after all an aspirational prayer, representing the aspirations of the Tibetan Buddhist sangha for the new king. It functions both as an expression of devotion to the new king and as a reminder of his duties as a good Buddhist king (chögyal). Yamaguchi has more evidence: a reference in an old catalogue (the Pangtangma) to a treatise called Analysis of the Difficult Points of the Madhyamaka, written by a certain King Pal Dünten. Now, U Dünten is the real name of Lang Darma, which is really a kind of nickname. If the king really wrote a philosophical treatise on that most difficult of subjects, could he really have become a persecutor of Buddhism? Perhaps this really does clinch Yamaguchi’s argument for a Buddhist Lang Darma. Yet the attribution of Buddhist philosophical texts to kings is not quite convincing. Several such texts are attributed to Trisong Detsen too, but would he really have had the time to write them? Isn’t it more likely that such texts were ordered by the king, and ghostwritten by a scholar? And what about the contemporary Chinese sources, like the Tang Annals, which describe Lang Darma as “fond of wine, enjoying hunting, amorous, brutal and cruel”? The first part of his nickname, Lang, means “ox” and is supposed to have described his ox-like build. This fits with the rather brutish character described in the Tang Annals. But the second part of the name, Darma, is an old Tibetan way of transcribing the word dharma. So the contradictory images of Lang Darma are right there in his name. Now I must end this post, still without an answer to the question with which it began. 1. Karmay, Samten G. 2003. “King Lang Darma and His Rule”. In Tibet and Her Neighbours: A History, ed. Alex McKay. London: Hansjörg Mayer: 57-66. 2. Petech, Luciano. 1994. “The Disintegration of the Tibetan Kingdom”. In Tibetan Studies, edited by Per Kværne. Oslo: The Institute for Comparative Research in Human Culture. 649–659. 3. Richardson, Hugh. 1971. “Who was Yum-brtan?” In Études tibétaines dédiées à la mémoire de Marcelle Lalou, edited by Ariane MacDonald. Paris. 433–43. Republished in High Peaks, Pure Earth, edited by Michael Aris. London: Serindia Publications. 4. Scherrer-Schaub, Cristina A. 2000. “Prières pour un apostat: fragments d’histoire Tibétaine”. Cahiers d’Extrême-Asie 11: 217-46. 5. Shakabpa, Tsepon W.D. 1967. A Political History of Tibet. New Haven: Yale University Press. 6. Yamaguchi, Zuihō. 1996. “The Fiction of King Dar-ma’s Persecution of Buddhism”. In Du Dunhuang au Japon: Études chinoises et bouddhiques offertes à Michel Soymié,edited by Jean-Pierre Drège: 231–58. Geneva: Droz. Dkar chag ‘phang thang ma / Sgra sbyor bam po gnyis pa. Beijing: Mi rigs dpe skrun khang. 2003. As mentioned above, Glang Dar ma is a nickname, and is not found in any of the pre-11th century documents (though he is known as Khri or Lha sras Dar ma). The king’s proper name was U’i dun/dum brtan, a rather unusual name which is confirmed by the Dunhuang manuscripts. As for the nickname Glang (“ox”), there are two possibilities, both found in Tibetan histories: (i) that it refers to the year of his birth, the ox year 809, or (ii) that it refers to his ox-like build. Since some of the earliest sources that use the name Glang for the king give his birthdate as 803 (not a year of the ox), Yamaguchi decided that the second option must be the correct one. As for Dar ma, we do find it in several Dunhuang manuscripts from the imperial period with the meaning of dharma or dharma text. According to Yamaguchi it can also mean “youth” but I haven’t seen this meaning attested in the Dunhuang texts. Perhaps it was a forgone conclusion that Tibet would become a Buddhist country, surrounded as it was by the Buddhist kingdoms of India, China and Central Asia. Nevertheless, Tibet was subject to other the influences of other religions during its formative period, and among those influences we may perhaps include Christianity. The best evidence of the involvement of Christian missionaries in early Tibet comes in the letters of Timothy I, who was Patriarch of the Nestorian Church between 780 and 823, overlapping with the reigns of three of Tibet’s great Buddhist emperors, Trisong Detsen, Senaleg and Ralpachen. Timothy I’s letters contain a couple of references to Tibet. In one letter, he lists the lands in which the Trisagion, one of the oldest Christian prayers, is recited. This list includes Tibet. In another letter, Timothy relates that he has recently appointed a metropolitan bishop for the Turks, and is about to do the same for the Tibetans. These references both date to the early 790s, during Trisong Detsen’s reign. As far as I know this is the only record of cross with a Tibetan inscription from Western Tibet. In addition, Giuseppe Tucci found small metal crosses, apparently worn as ornaments, in the same regions. Now let’s turn to Central Asia, where we have another interesting assortment of crosses, and a Tibetan reference to Jesus the Messiah. 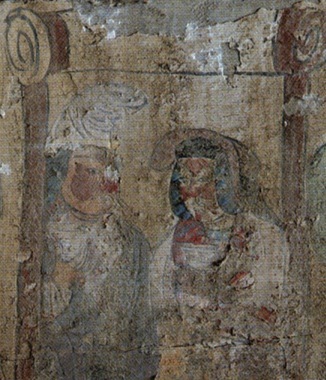 First of all, there is a rather beautiful painting from Dunhuang, which at first glance looks like a bodhisattva. On closer inspection, we can see that his crown and necklace are adorned with crosses. What we have here seems to be a picture of a Christian (probably Nestorian) saint, by an artist trained in the Chinese style. 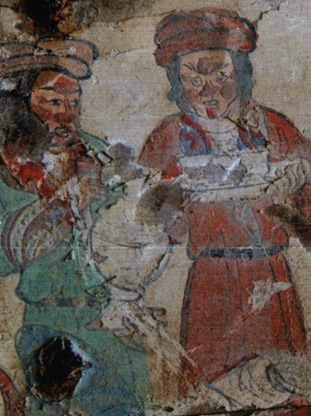 Roderick Whitfield dates the painting to the late 9th century, shortly after the Tibetan rule of Dunhuang. Man, your ally is the god called “Jesus Messiah”. He acts as Vajrapāṇi and Śrī Śākyamuni. When the gates of the seven levels of heaven have opened, you will accomplish the yoga that you will receive from the judge at the right hand of God. Because of this, do whatever you wish without shame, fear or apprehension. You will become a conqueror, and there will be no demons or obstructing spirits. Whoever casts this lot (mo), it will be very good. Géza Uray argued that the Christian elements here must have come from a Nestorian source, especially the idea of Jesus as the judge at the right hand of god, which is found in the Nicene Creed of the Nestorians, a copy of which is found in a Sogdian 9th-10th century manuscript in Turfan, not so far from Dunhuang. Rolf Stein, on the other hand, argued for a Manichaean source. Perhaps the source is not terribly important here anyway, since Jesus seems simply to have joined the array of local and Buddhist deities. To these I’d like to add another cross, one that nobody has ever mentioned it before, partly no doubt because the manuscript was passed over in de la Vallée Poussin’s catalogue and didn’t even have a number until recently. IOL Tib J 766 contains the sketch of a cross that is shown at the top of this post (just click on that image to view the whole manuscript). The manuscript is just a strip of paper, probably an offcut from a manuscript, which has been used as a doodle pad by a scribe. The writing is Tibetan and a Sogdian or Uighur script, perhaps both written by the same scribe, who may have been a Uighur Turk who also wrote in Tibetan. As we know that Nestorianism was quite popular among the Uighurs, this would make sense. This particular cross has three beads at the end of each arm. It’s quite similar to the one in Pelliot tibétain 1182, which has three lines at the end of each arm, and to the cross in the crown of the saint pictured above, which has two beads at the end of each arm. Having reviewed the evidence, it seems after that Buddhism was never in much danger of being supplanted by Christianity in Tibet. Even so, when we think about Timothy I’s appointment of a bishop for Tibet during the reign of Trisong Detsen, and see sketches of crosses surrounded by Tibetan writing in the Dunhuang manuscripts it becomes possible to imagine an alternative history. And having this so clearly, and visually, impressed upon us might encourage us to think again about the reasons for the ultimate success of Buddhism in Tibet. 1. Francke, A.H. 1925. ‘Felseninschriften in Ladakh’. In Sitzungsberichte der Preussischen Akademie der Wissenschaften. Philosophisch-Historische Klasse. Jahrgang 1925: 366-371. 2. Klimkeit, H.J. 1979. ‘Das Kreuzessymbol in der zentralasiatischen Religionsbegegnung’. In Zeitschrift für Religions-und Geistesgeschichte 31.1: 99-116. 3. Stein, R.A. ‘Une mention du manichéisme dans le choix du bouddhisme comme religion d’état par le roi tibétain Khri-sroṅ lde-bcan. In Indianisme et bouddhisme: Mélanges offerts á Mgr Étienne Lamotte. Louvain-la-Neuve. 329–337. 5. Uray Géza. ‘Tibet’s Connections with Nestorianism and Manicheism in the 8th–10th Centuries’. In Steinkellner and Tauscher (eds), Contributions on Tibetan Language, History and Culture. Vienna: Arbeitskries für Tibetische und Buddhistische studien Universität Wien. Do also visit the Tibeto-Logic blog for a fascinating dissection of the popular story of Jesus’s visit to Tibet. In the Accounts of Ba it is said that the land of the red-faced men is China. Well, the Accounts of Ba is one of our oldest Tibetan histories, and we should pay attention to what it says. When we look into the Accounts of Ba we do indeed find a mention of a prophecy about Buddhism coming to the land of the red-faced men. 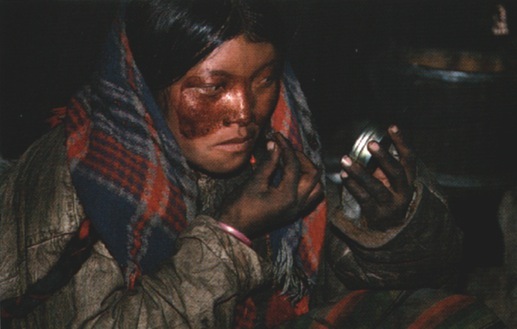 A version of this story appears in both the Accounts of Ba as published by Gönpo Gyaltsen in 1980 (Sba bzhed) and the older version published by Pasang Wangdu and Hildegarde Diemberger in 2000 (Dba bzhed). It is possible to see from this passage what made Butön think that the land of the red-faced men was supposed to be China. There is some ambiguity about whether the emperor is linking the prophecy to Ba Selnang and Ba Sangshi’s appearance in Tibet or to their arrival in China. I would certainly argue that the former was intended rather than the latter. Fortunately I can draw on the support of another great Tibetan historian here. According to the all-knowing Butön, the Accounts of Ba state that the country of the red-faced men is China. But in the Accounts of Ba it is said that when Ba Selnang and Ba Sangshi were sent to China to receive the dharma, an expert in divination said: “Emanations of bodhisattvas looking like this will come as messengers,” and he drew a picture. So when [Ba Selnang and Ba Sangshi] arrived they were given a great reception by the [Chinese] emperor. [The emperor] said, “There is a prophecy that a bodhisattva will appear in the land of the red-faced men who will be a source of the dharma. I am certain that it is you,” and he gave them 1,000 volumes of dharma. So it is very clear that the land of the red-faced men is indeed Tibet. 1. Bu ston rin chen grub. Chos ‘byung gsun rab rin po che mdzod [History of Buddhism]. Beijing: Khrung go bod kyi shes rig dpe skrun khang. 1988.